To use this form place the quanity in the space provided then hit the "Buy Me" button. You can always change your mind later because the transaction is not processed until you submit your credit card information. Any questions can be answered by calling 609-494-1900 or you can email us at orchidannie@interiorwatergardens.com. Size is listed Diameter X Depth. 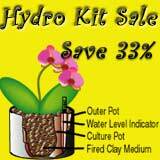 All kits include culture pot, plastic outer pot, water level indicator, hydroculture growing medium and a years supply of nutrient. This Months Special: Buy two 4.5" X 3.5" kits get one kit free.